You can also make Nutter Butter--peanut butter or Andes Mint--Milano cookie variations of these bars. Heat oven to 350 degrees F. Grease an 8-by-8-inch baking pan and line with a strip of parchment, allowing edges to hang over opposite sides. Substitute smooth peanut butter for 1/2 cup of the unsalted butter in the chocolate chip cookie recipe. Make as directed otherwise. 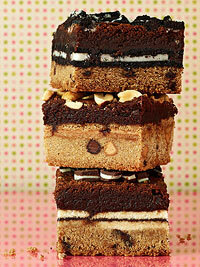 Use Nutter Butter cookies in place of the Oreos and sprinkle peanuts on top of the brownie layer. Substitute chopped Andes Mints for 1/2 cup of the mini chocolate chips in the chocolate chip cookie recipe. Make as directed otherwise. Use Pepperidge Farm Milano cookies in place of the Oreos and sprinkle extra chopped Andes Mints on top of brownie layer just after baking.